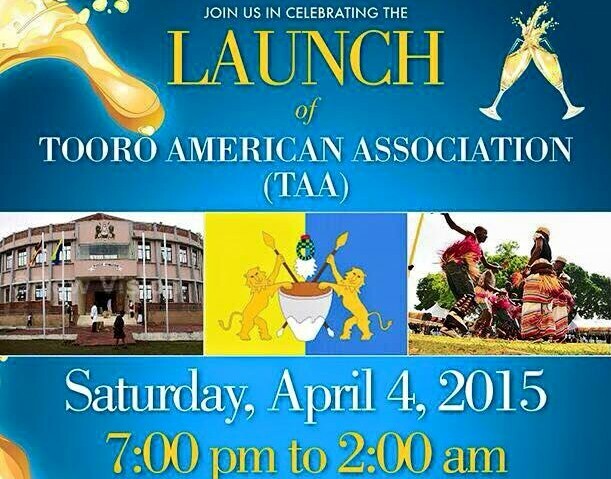 On behalf of the Board of Directors, Members, and Friends of Tooro American Association, Inc. (TAA), I cordially invite you to the official launch of the Association on April 4, 2015 (7:00 am – 2:00 am) in Chevy Chase, Maryland. TAA is a duly registered development, education, and culture-centered charitable organization based in the Washington DC metropolitan area. It is transparent, apolitical, and open to all sons and daughters of the greater Tooro region and friends of Tooro in North America. The event will bring us together under one roof for a festive and fun-filled evening to break bread and network as kin and friends of Tooro. We will also showcase our beautiful land, people, and culture; as well as highlight potential development projects we plan to undertake or facilitate in order to empower ourselves and our communities – both here in North America, and back in our motherland, Tooro (and Uganda at large). Thank you, I hope to see you on April 4, 2015.